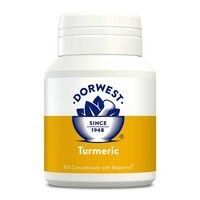 Dorwest Turmeric Tablets is a quality source of turmeric herb (Curcumin) which is widely used to support the body’s natural anti-inflammatory processes. Extracted from the whole root and containing 95% curcuminoids, the turmeric extract in these tablets is traditionally grown in its native region of Southern India using sustainable small farming methods and is renowned for its purity. A patented form of Piperine called Bioperine is included in this formulation to ensure bioavailability is maximised. Recommended to be given for a minimum of one month.